Clever Cleaner is perfect for you who focus mostly on function. It is a construction proved easy to use and durable for many years in differnt places of the world. Frame and shield is in stanless steel and in the control system you are able to store about 120 different programs to form up to 60 different recipes. Clever Cleaner has 50 meters of hose on the hose-reel and can be equipped with many different options, including electric transport wheel. Clever Cleaner is programmed via a joystick which controls the robot motions simultaneously as they are stored in the controlling computer. Just one programming per different pen type is necessary. The robot can then repeat the learned movement pattern of every similar pen. A washing program for the whole section is then put together and stored in the computer. 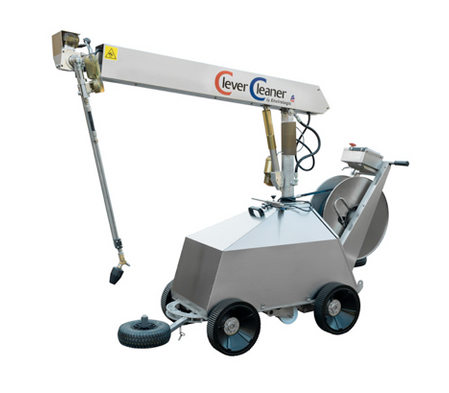 The delivery of your Clever Cleaner includes not only installation and operator training but also assistance and help with the first programming. Should anything happen to your Clever Cleaner we will not let you down. We have a large network of skilled technicians and they can quickly be on site wherever you are in the world!